Paper wasps vary in color. Some are black, yellow or red and others can be black and red or even brown and red. In other words, they come in many different colors. This video shows one of the more commonly seen species and was shot in the early spring. This next video features wasps filmed close up as they emerge from a Fescue Lawn. WHERE TO WASPS BUILD NESTS? 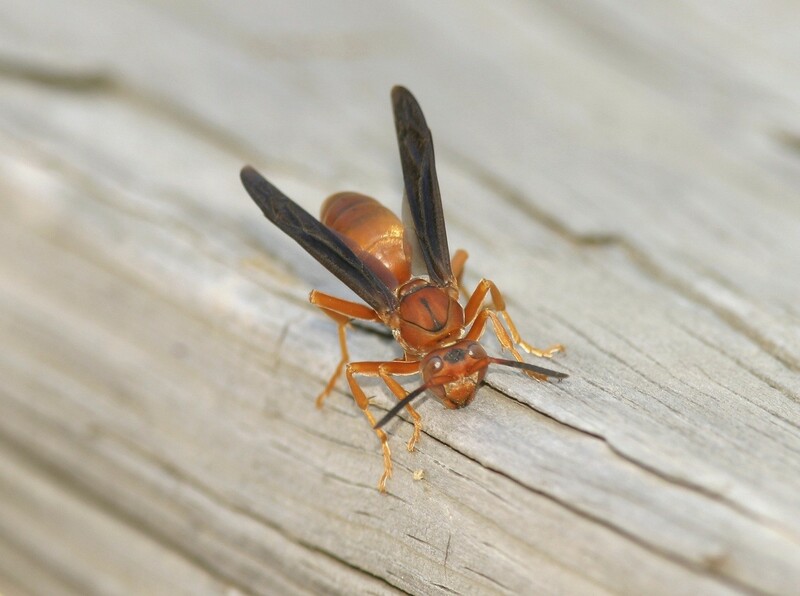 Wasps can build nests on homes, under soffits, behind sidings or window shutters and just about anyplace which provides some type of shelter from the elements. These nests are usually small in size and population. 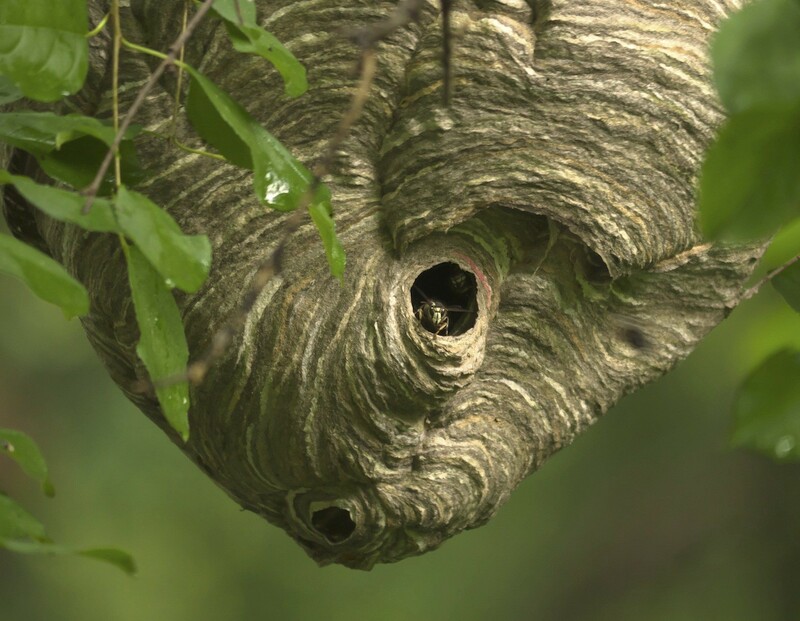 Many times wasp nests are in cracks of wood and cannot be seen. Here the wasp will nest in between siding, insulation and any other void they can find underneath soffits, around gutters and windows. Paper wasps do not fly as fast as bald faced hornets and are generally not as aggressive. If activity is high, just watch from a distance and chances are you will quickly locate where the main nest sight is located or hidden. Paper wasps are also very curious. It is quite common to find them flying around people since they are attracted to moisture and sweet odors. Also, most wasps have good eyes and will catch you approaching once you get within 10 feet of them. They will readily fly toward sweat, perfume, food, flowers, dead insects and other things commonly found around the home. In fact, wasps can become quite a pest – even if you are just trying to sit out on your deck or around the pool. For this reason they are generally considered to be a pest when active around the home and most people don’t like seeing them when outside. WHEN ARE WASPS A PROBLEM? For most people, seeing wasps around the yard is a problem. Typically this will start in the spring and once they establish a flight pattern for the season, they’ll repeat their traveling path all summer and fall. Ultimately many species of wasps will look to overwinter or hibernate on building and this is when they can become a problem inside the home. And obviously when they form a nest on a home or nest up underneath a homes siding they can be a present danger to anyone who gets too close. So the simplest way to deal directly with any wasp in the home is the use of a HAND HELD ZAPPER. 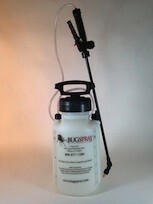 This device is great for all types of insects like mosquitoes, flies and spiders but is particularly effective on wasps. Simply touch the electric grid to any wasp and it will instantly die from the mild electrocution. This “Electric Swatter” is quite effective and since you don’t actually “swat” the target, there is no mess. To keep wasps away from the home, you can try using a visual deterrent as well as wasp repellent spray and dust. First, installing FAKE WASP NESTS in areas where wasps are foraging will drive them elsewhere as long as these are installed in early spring. These nests look like the real thing and wasps will generally avoid nest locations inhabited by other wasps. Keep in mind these will not work if installed mid season nor will they help route wasps away from flowers, grass or your pool. These are only intended to help prevent nesting in the immediate area where installed. These fake nests pose no hazard to people or pets and can be hung from any piece of furniture, tree or plant. Set at least one out for every 5000 sq/ft of yard and they will help minimize the local wasp activity too. For better results, use a spray or dust. We have two spray options that wasps don’t like and when applied to the home, they’ll detect its present and stay away. The first is NBS which uses essential plant oils as its active. These ingredients are highly repellent to insects like carpenter bees, wasps and ants. This product can be sprayed on surfaces or added to paint or stain. When mixed with paint or stain, it’s able to “lock in” and provide a year or more of protection. 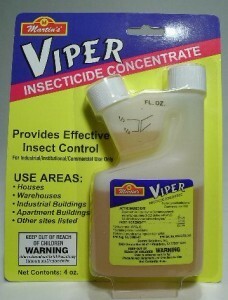 When used as a spray, it will last 30 days keeping away most any insect pest including wasps. Keep in mind is essentially an “organic” approach as the NBS will not kill or impact any insect; it will just repel them from the area. To use as a spray, add 3 oz per gallon of water and spray the mixture over 500 sq/ft of surface area once a month. When added to paint or exterior stain, add 16 oz to every 5 gallons of paint or stain and use every time you apply a new coat. If you want something stronger, go with CYPERMETHRIN. This is a traditional pesticide and will do a better job of repelling them. Treatments will last longer too. Mix 1 oz per gallon of water and spray over 500 sq/ft of surface area. Expect to get 30-45 days of protection per treatment and renew the application during the spring, summer and fall. Now as good as Cypermethrin is at repelling wasps, DRIONE DUST is even better. Considered to be “the best” because a single treatment can last a year or more, Drione is highly repellent to most any insect and therefore where Drione is applied, insects will not go. For this reason Drione is ideally suited for pests like wasps. Drione is also highly effective when used to directly treat any nest you can reach. For exposed paper wasp or bald faced hornet nests, Drione will provide instant control. This can be important if you have several nests to treat and can’t wait for the non-repellent sprays listed below to their job. To use Drione effectively for wasps, you’ll want to get some into every crack and crevice you can find on the home. Typically this will be up under siding, along facia boards, behind gutters, behind shutters, around window frames, etc. If the home has vinyl or aluminum siding, you’ll want to get some dust behind the siding too. As you can tell from the video above, the dust naturally finds it’s way into cracks, crevices and voids where wasps like to nest and roost. It will cling to surfaces making it impossible for wasps to walk or use the area forcing them to go elsewhere. A great place to apply it is through cracks and seams of decks. Though these small gaps may look too tight for any insect to enter, they actually make prime locations for many pests to hide and make nests. Drione goes a long way too. The average 2500 sq/ft home would expect to need just 1-2 lbs of dust applied to its exterior. So if the home is mostly brick or stucco and you only have trim areas to treat, 1 lb will be plenty. But if the home uses some kind of siding like vinyl or cedar shakes, expect to use 2 lbs or more. Be sure to get all cracks and crevices when dusting don’t worry about any dust left on surfaces after being applied. It will naturally blow away over time and won’t be a hazard. To apply the drione, you’ll need a good duster. We have several options available. The simplest is used in your hand and designed for when the treatment is within reach. This duster is easy to use and is considered a standard for anyone doing regular pest control. The CRUSADER has been around a long time and comes with both a 6″ and 12″ long extension. Since facia boards, gutters, roof lines and most any type of siding can provide similar ideal nest locations, you may have to reach up 10 feet or more. To help do the work without having to climb a ladder, consider any of the following dusters. The first is the DUST-R . This model has a large dust canister and because of its length, will let you reach 3-4 feet up and above will reach up is ideal for when you have a lot of treating to do. It features a large dust tank which cuts down on how much time you need to spend filling it. If you need higher reach, the LONG REACH DUST-R might be the better choice. It’s essentially the same unit as the Dust-R but it comes with a series of extensions which enable the applicator to reach over 12 feet up while standing on the ground. Of course you can use it while standing on a ladder for additional coverage. For the highest reach, the DUSTICK is the ideal tool for the job. It features 4 extensions which can be used one at a time or all together. Combined with the dust canister on top and the pump assembly on the bottom, you will be able to treat locations over 25 feet high while standing on the ground. When you have a lot of facia boards and trim on the home and wasps are penetrating through such locations, Drione Dust applied with one of these dusters is the best bet for long term control. It will kill them on contact as well as repel them so they don’t return. It’s also strong enough to dry up the eggs as well as the pupae stages so it’s worth covering as much area as possible when treating. Remember, Drione dust lasts a long time and will stay in the void providing wasp control for several months. And since it will control just about any pest, it’s by far the best, long lasting product to apply around the home for all kinds of pest control. No doubt it takes a bit more work to use it but in the end, dusting is well worth the effort. In fact fall treatments for wasps are important since many species will hibernate on structures like homes and sheds. The following spring they will emerge and tend to start new colonies in areas close to where they over winter and hibernate. If you have seen a lot of wasps collecting on the outside of your building in any fall, it would be smart to prevent this from happening in the future by treating with Drione. This is the only way to stop future invasions because once this pattern starts, it won’t stop. In other words, it will get worse and worse from year to year because wasps will be “scenting” your home (leaving pheromones) that will attract more wasps. The following video shows what this looks like when fall arrives and wasps start to “gather” for winter hibernation. No doubt attic spaces will be used by wasps too so if you want to keep them out of this area, apply Drione using DUSTIN MIZER. This tool will let you blow the dust out over the space effectively blanketing all surfaces without having to do much walking. The Dustin Mizer will project the dust 20 feet or more and since Drione will last at least a year, you only need to apply it once a season. If you have active nests in a tree or on the home, there are a few ways they can be treated. The most common way is to use a hornet and wasp freeze. When nests are visible and easy to reach, this can be effective. Be sure to use a strong formulation – especially when dealing with Bald Faced Hornets. In fact Bald Faced hornets are actually wasps too. 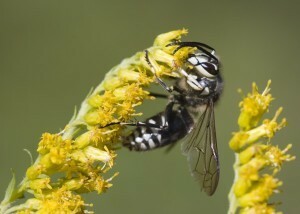 They are black with white or yellow stripes around their thorax and abdomen. They’re about one inch long, can fly very fast and can get quite aggressive if you get close to their nest. Bald faced hornets create a large football shaped nest which is grey and oval. It ranges from softball to beach ball size and nests can form from early summer right through to fall. These nests are made from cellulose (wood and plant material) and are quite strong as well as weatherproof. Likely nest sights include trees, shrubs and around overhangs of buildings. If you can get within 10 feet of the nest, you should be able to treat it with the WASP FREEZE. But to be safe, liquid treating with CYPERMETHRIN and SPREADER STICKER is the way to go. Now if you can’t reach the nest well with the freeze, go with Cypermethrin and Spreader Sticker. 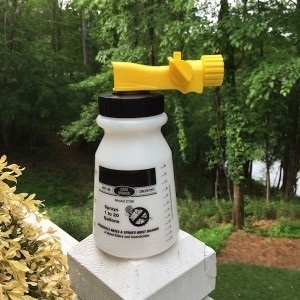 Add 1 oz of Cypermethrin and 1 oz of Spreader Sticker per gallon of water and using a good PUMP SPRAYER, saturate the nest in the evening just before dark. Cypermethrin is strong enough to knock down any wasp but if you still see activity the day after you treat, do another application the following night. 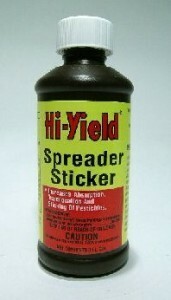 Be sure to add 1 oz of Spreader Sticker to the tank mix. 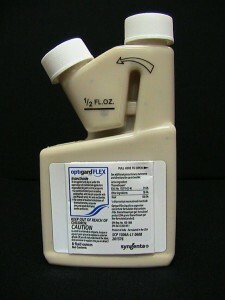 This material helps the Cypermethrin penetrate and “spread” much faster leading to a faster death of all treated pests. You will need a good PUMP SPRAYER to make the application when treating nests and our heavy duty sprayer can reach up 20 feet or more when using the pin stream tip insert. For even higher reach, use a HOSE END SPRAYER. This uses the power of your garden hose to reach up 25 feet or more and can really “blast” the nest full of chemical. When treating with Cypermethrin and a hose end, add 2 oz of Cypermethrin, 2 oz of Spreader Sticker and add enough water so the sprayer is filled to about the 2.5 gallon line. This would be about 1/8th full. Next, hook it to your hose and use the entire contents on the nest. Do the treatment at night to insure the nest is at rest when treating. When done properly, the nest will be shut down in an hour or less. The following video clip shows how they react to the treatment. For nests that are hidden under the siding of the home or in the nook of a tree, you’ll be best served using a “non repellent” spray. These are also well suited for specific locations like a weep hole, electric cable box, around a pipe line, etc. These unique chemicals are undetectable by target insects so they won’t know the treatment is present. These options don’t work quickly; in fact they’ll take 4-6 days to completely work. But they’re highly effective and ideally suited for when you have nests well hidden and don’t want to risk spooking the wasps into your living space. We have two formulations that can be used. 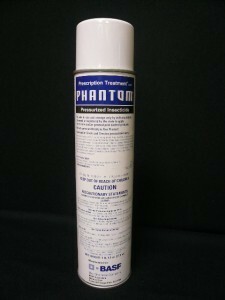 For any area within reach, PHANTOM AEROSOL is a good option. You’ll want to make your treatment at night, just before dark, and you’ll want to spray the entrance hole for 10-15 seconds and then quickly leave the area. In most cases, the wasps won’t have time to react and since they don’t know they’re being sprayed with chemical, they won’t get too bothered. But one treatment won’t be enough so you’ll need to do the same treatment the next night and then again, one more time, on the third night. Once you start treating, the wasps will in turn start carrying the product into their nest no matter how deep it might be. This will happen as they naturally move in and out of their nest in the days following the first application. To insure enough chemical enters the nest, you need to make 3 treatments over the course of three evenings but by the 3-4 days, you’ll start to notice a big decrease in their activity. And by the 4-5th day, the nest will be dead. One can of Phantom is enough to treat several nests and since it can be used inside the home too on a wide range of other pests, its a good product to have for all types of applications. Since you need to be within 1-2 feet of the nest to make a good application, you may need an AEROSOL POLE to help deliver it where needed. This pole will allow you to reach up over 20 feet and extra 4 FOOT EXTENSIONS can be purchased as needed. The tool is easy to use; simply affix the aerosol on top and then slide it up the side of the home adding extensions as needed until you can reach the nest to treat. If you have several nests to treat or would prefer to use a liquid, we have a non repellent concentrate known as OPTIGARD that will do the job just as well. Using a PUMP SPRAYER or HOSE END SPRAYER, this concentrate can be mixed with water and then sprayed onto their entrance holes just like the Phantom. Do this 2-3 nights in a row and after 4-5 days, the nests should be shut down for good. For wasp treatments, you’ll need to add 1/2 oz of Optigard per gallon of water and spray entrance areas for 10-20 seconds per night right at dark. Repeat for 3 nights in a row and the nests will be shut down in 3-5 days. Optigard can be used on trees, shrubs and flowers too if you want to keep wasps off these surfaces without knowing where a nest might be located. If you are a pool owner or have some other body of water close by the property, you may have noticed local wasps coming around to get a drink. And if it’s been hot or dry where you live or if you have a bird bath or other water supply, expect wasps to find your “offering”. As moisture evaporates into the air, wasps and other insects will detect it’s presence. This will attract them to the area and once found, “word” will be out on the street attracting other insects and more wasps. In other words, expect more and more of the local population of wasps and other insects to come around if your yard is providing some water when local areas are dry. Dealing with such invasions difficult but there are some treatments that can help reduce this activity. No doubt the best way to stop wasps or bees from visiting your pool or jacuzzi is to treat the water with KILL IT ALGAECIDE. This product is generally used to control algae but it will also repel wasps, bees and any insect from drinking your water. This repellency action happens because Kill It reduces the surface tension of the pool water making it impossible for insects to land. Now if they try, they’ll sink so they will avoid water protected by Kill It. Add some weekly during the summer months when wasps, bees and other insects are annoying you in the pool and they’ll stay away. Now if you have been seeing wasps on your home and you don’t kill them before they move under siding and into the wall voids, there is no doubt you’ll be seeing them inside. This can happen in the summer but its actually quite common in the winter too. In the cold months, wasps that moved onto your home the past fall which were not treated or repelled will move inside seeking the warm temperatures. Typically they’ll emerge and remain quiet for a day or two hanging around a window or ledge. Any that are seen can be sprayed with the PHANTOM listed above. It won’t spook them but after 2-3 days, it will kill them. Treat any area you find them landing when active in the winter and renew treatments once a month as long as you continue to find dead wasps once you start treating. This insures you’ll have a good treatment in place to control any new ones that emerge throughout the cold winter months. Wasps and Bald Faced Hornets can be frightening. Dust the exterior of the home once in the spring to prevent them from moving in and using your home for a nest site or winter haven. And when wasp nests are found, keep people away to prevent anyone from getting stung. Treat nests at night for quick and complete control and remove the nest once all activity ceases. I believe we have a wasps/hornets nest in the attic can’t we see it cause we can’t get into the crawl space but I have seen a number of wasps going in there from outside. I have only seen one in my house but I’m not sure what I should do.. If they’re not bothering us is it a bad idea to just leave it and by winter they will all die? And if I do use spray will it work even though we can’t spray the actual nest and just spray the spots they’re going in and out from? Allowing most insects direct access to your home is a bad idea and this is especially true when it comes to pests like wasps and bees. I suggest you treat it immediately to remove any current threat as well as the long term problem that will surely arise once they begin using your home this way. In our experience, once a home is used by wasps to nest, more and more will come every year leading to multi-nests annually instead of just one like you see now. Suffice to say this is not good. Since you have spotted a location they are using on a regular basis, you’ll need a special product to handle the job that can work even though you don’t know where the nest is located. Fortunately for you, there is such a product out there. Known as Phantom, this active comes in an aerosol. It acts on pests very slowly taking several days to kick in. Additionally, it’s not detectable by insects. So to use it all you’ll need to do is go to their entrance hole and mist it for 2-3 seconds every morning and that’s it. Now assuming you’re spraying the hole they’re using to pass through and into the home, some of the wasps will transfer the active from the Phantom onto their body as they pass through the hole. Once on their bodies, they’ll in turn be bringing it back to their nest where some will no doubt get on other wasps. Eventually it will kick in and when it does, so many will have had an exposure that the net impact will be the end of that nest with all of them (along with their young) dying. Now if you were able to spray their nest directly with the Phantom, it would only take one treatment to knock them out. But for the reasons you cite, this is not an option so it will take a bit longer because you won’t be treating the entire nest at one time. I’m also afraid the treatment will wear out daily with wasps passing over it removing the active as they’re moving which is why I suggest you treat daily. This way more and more of them will get an exposure and even though it won’t be all of them at one time, it will still be enough to kill them. The good news is that the treatment is simple and will only take a couple of seconds to do. And if you keep doing this daily until you don’t see any activity, the nest will no doubt die in a week or less. I say a week or less because that’s what we’re hearing from our customers so we know it will do the job; we just can’t predict exactly how long it will take but it will work and since you don’t know where their nest is located, this approach makes the most sense because it will be so easy to do. Good luck! Thank you so much. I’m gonna get some and hopefully I can get rid of these pests!! Hi, it’s me again. Before I purchase this I was wondering the distance of the spray? One spot they are using is pretty high up on the house I just wanna make sure it’ll reach! Thanks again! It doesn’t have much pressure so it won’t spray far. Maybe 2-3 feet. That means you’ll need to get the can as close as possible to the hole when doing the application. 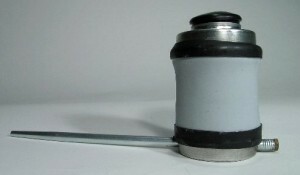 To help, get one of our Aerosol Poles with the Aerosol Sprayer Attachment. It’s easy to use. I have both the 14 Foot Pole and the 30 Foot Pole and it enables me to reach any part of my home. Definitely well worth the investment because you can attach a Cobweb Remover Head to it which I use all the time for unwanted spider webs. So between the Web Remover and the Aerosol Attachment, I use mine several times a year. I have what I believe are mud daubers in a room that was added on probably 20 years ago, wooden attached to a cement house in central Florida (Florida has too many bugs, UGH), and when I changed out a drop down ceiling about 2 months ago, about 30 lbs of nests (that were tucked into recesses and nooks of ceiling—fell on top of me and shattered everywhere. Thank GOD it was cold out-but no wasps. Probably a build up of 20+ years. The room was built poorly, and the fireplace has gaps around it, one big mess. My roommate did not want to fix cracks, so up went the new ceiling. Just now the 1st wasp came inside- probably a queen? At least 1 1/2 inches of black HORROR. BTW I am terrified and freaked out by these things, been stung too many times. What is my best course of action? It’s getting warm, they are building a new nest or 10 inside… ewwww. Help. As bad as your situation sounds, I’m sure if you follow my recommendations you can both control and prevent mud daubers from nesting on your home and in the space above the drop ceiling. Here’s how. First, treat all the cracks and crevices you can find on the outside of the home with Drione Dust. This product will last a good 6-12 months, it will kill any daubers (or other wasps) that pass over it and its extremely repellent to flying insects. So in theory, you should be able to greatly reduce their ability to travel into any voids or cracks which in turn will reduce the amount living above your ceiling. Second, spray all these surfaces with Cypermethrin. Like Drione, Cypermethrin is repellent to all insects and they’ll avoid where its been applied. Next, you’ll need to gain access to the area above the ceiling and treat it one of the following ways. The first would be to spot treat as much of it as possible with Phantom aerosol. This product will last 2-4 weeks, goes on “dry” and is odorless. A good treatment to all the surfaces, cracks and spaces they’re using will shut them down within a week. Now if you’re not able to reach all the surfaces above the ceiling, you could opt to install 1-2 Aerosol Machines instead of manually applying the Phantom. These machines run “automatically” and can be configured to release a small amount of Metered Insecticide every hour. And though the machine will only set out a little bit every time it sprays, the net result will be that any insects up there in the treated air space trying to nest will die. Refills last 30-45 days depending on how frequently you configure the unit to release chemical but you don’t need to be extreme. And they’re both small and easy to configure making them pretty much maintenance free since the battery will last several months and refills a good 30-45 days. All these options are discussed in great detail in our Mud Dauber article so I suggest you read through it for more detailed information. It’s me again! I asked about wasps and I have read your entire site. My problem is that I believe we have a revolving wasp’s nest in our chimney. The top of the chimney is not accessible via the roof. The roof is too steep. I thought I read before that the Purge III and the Aerosol 1000 would work if placed in the fireplace. Is this correct? When reading about Purge III it does not mention wasps. Thanks in advance for the help! No doubt wasps can use the top of a chimney to nest or overwinter. And from there, fly down and make their way into living spaces. Now having helped customers deal with this problem many times, we’ve learned about works, what doesn’t work, etc. And for this kind of problem, we first learned that spraying PT-565 up the flue will both kill and repel any wasp trying to use the space. Basically this product uses pyrethrin for an active and wasps hate this active so much they will avoid where its present. Review the label and you’ll note it has wasps on it. Now over time, we begin to notice a limitation of the 565. Basically treatments didn’t last long and you had to manually control the applications. And since treatments only last an hour or so, it became painfully clear that most people don’t have the time to be spraying the 565 every hour or two into fireplaces that needed applications done over and over. That’s when we decided to try using an aerosol machine and one of the refill options we have available. Since they use the same active (pyrethrin) but in a stronger %, it stood to reason that they would both kill and repel wasps effectively. And after several machines were deployed, it became clear they do in fact work quite well. The great thing about this setup is that you can “set it and forget it”. At least for about one month per refill. Since the machine goes off on its own over and over, you will assuredly have a renewed amount of pyrethrin in place working all the time and for the most part, this is important for this technique to work. So in summary, even though the refill options we have only list pests like flies, mosquitoes, moths and gnats, they will also work on wasps and other flying pests. But the label doesn’t include pests like wasps because for the most part, there isn’t a big need for such insects to be included. Sorry for the confusion; hope this helps! I have a question about bees & bald-faced hornets. My home had a bee nest before I moved in a year ago. The nest was taken care of but I notice there’s still activity, specifically in an upstairs windowed-bathroom. I had to kill two bees that entered last spring. This year, I’ve killed two more plus I noticed a few dead bees inside the window when I first opened it after winter (I treat the interior bathroom and window frame with Phantom I bought from U-spray regularly). Today at dusk, there was a bald-faced hornet hanging on the outside of the screen. I’m wondering, can bald-faced hornets detect prior nesting areas and decide it’s a good place to move in? Reason is, since I’ve killed bees even AFTER the nest was removed, it makes me think they left some sort of chemical signature that other insects, like that hornet, can detect. That area of the window seems to attract bees and even Asian Lady Beetles. Or could it be the hornet was just resting and will move along? It hung on the screen for about an hour before dark. The temperature dropped dramatically at sunset so I thought maybe the chill hindered the hornet. Thanks for the help; I love U-spray and am very happy with the products I’ve ordered as well as the past customer service. Once a home has a nest built on it, the tendency is for more to develop in the future. This happens whether the species is a bee, wasp or hornet. Its not clear if this happens because the structure is something these insects are choosing naturally or because of some “scent” left from previous nests. But like history itself, the event seems eminent at some point in time so what you’re experiencing could be related. Moving forward, I strongly suggest you dust the homes exterior with Drione Dust and then a day later, spray the siding with Cypermethrin. Drione treatments in the spring will stop most any insect for the season so its generally only needed once. More important, Drione will help “remove” odors because of its desiccant action. Cypermethrin is highly repellent to all insects and where applied, they’ll avoid. Flying pests like bees and wasps can’t stand it so again, surface treating with Cypermethrin will help and should be done throughout the year as needed. Both of these items are listed above and they work in tandem well with one another; the Drione takes care of the cracks and crevices and the Cypermethrin all the open surfaces.